PARIS -Canada's Radarsat-2 Earth observation satellite, which has been almost a decadein design and construction, launched successfully Friday aboard a Russian Soyuz-Fregatrocket from Russia's Baikonur Cosmodrome in Kazakhstan, according tolaunch-services provider Starsem S.A. of France. The 4,850-pound(2,200-kilogram) Radarsat-2 is expected to operate for seven years in a 495-mile(798-kilometer), sun-synchronous low Earth orbit and provide radar images witha ground resolution as sharp as 10 feet (three meters) and as wide as 328 feet(100 meters). 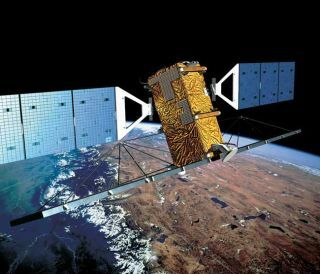 Despitebeing delayed by a host of technical and policy issues over the years, Radarsat-2arrived in orbit in time to assure continuous radar Earth observation forCanadian authorities before Radarsat-1 is retired. Radarsat-1,which provides images with a maximum sharpness of 10 meters, was launched in1995 on what was designed as a five-year mission. It continues to operatetoday. Radarsat-2features an improved on-board memory and image-taking flexibility as well as ahigher-resolution imaging mode. It is the product of a partnership between theCanadian Space Agency (CSA) and MacDonald, Dettwiler and Associates (MDA) ofRichmond, British Columbia CSA has said its total Radarsat-2 budget is 421.6million Canadian dollars ($419 million), and that MDA has spent an additional90 million Canadian dollars on the satellite. The launchof Radarsat-2 brings to a close an unusually busy year for radar Earth observation.German and Italian high-resolutionradar satellites also began service this year, for both government andcommercial customers. MDA isRadarsat-2 prime contractor, with Thales Alenia Space of France and Italy providing the satellite platform. An MDA unit supplied the radar sensor. The launchwas managed by Starsem of Paris, a French-Russian joint venture that marketsSoyuz rockets commercially.